We at Kitchen Stories totally love these get-togethers, where everyone brings their favorite food, and you can give new dishes a try—just the way you like (and more often than not, you like it all). Whether it's a relaxed weekend brunch, a cozy birthday party, or a spontaneous weeknight-dinner with friends—finger food is always a good idea. The benefits are obvious: No one has to spend the whole day in the kitchen preparing a huge buffet, and potential allergies or fancy dietary preferences of your guests are no longer a problem, since there will be a wide range of food for everyone’s taste. 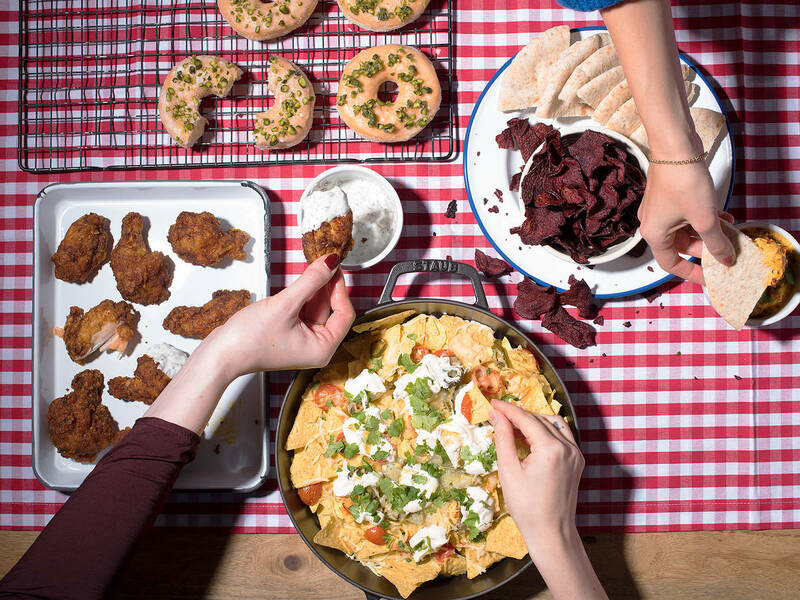 Are you already planning your next finger food party? Try these 7 recipes, and we promise there will be nothing left on the table but crumbs (or not even that)! Get the party started with these fabulously crunchy beet chips! Make them at home, and you will never choose store-bought beet chips again. Although they’re already perfect in taste, the creamy feta-yogurt dip makes them even better. No one can resist a golden and crispy focaccia fresh from the oven. This one is full of flavor from garlic and rosemary. Cut into bite-sized pieces and served just after baking, this Italian focaccia is the perfect finger food for your next shingdig. Literally, all we need in life (or at a party) is hummus and bread. Using roasted carrots and some cumin, we’re putting a special twist on this finger food classic. Serve it with pita bread, fresh vegetables, or any other kind of side you like. Don't even think about heading to a finger food party without a batch of this! Marinated in buttermilk, these crispy, juicy, and incredibly tasty fried chicken wings will beat them all. Caution! These little guys are seriously addicting. Do you like your brownies as chewy, dense, and fudgy as we do? Then these homemade brownies with pecans will convince you to ditch those boxed brownie mixes forever! Our favorite word to hear in front of nachos is "loaded." Topped with pulled chicken, tomatoes, jalapeños, and creamy, melted cheese they will disappear as soon as they hit the table. Doughnuts make everything better—there is no discussion about it. These glazed doughnuts are the perfect sweet finish for your finger food party. Chopped pistachios and fresh lemon zest add great flavor to these deep-fried tidbits. What’s your favorite finger food recipe? Tell us in the comments, and upload a picture for all to enjoy!